When choosing a riding instructor there are several things you will want to consider. Riding lessons are supposed to be fun, enjoyable, safe and done in an environment that is conducive to learning. A bad riding instructor can discourage you in a hurry or worse yet get you hurt. You also don’t want to be with an instructor that makes you feel stupid when you ask a question. If you don’t have a horse taking lessons is a way to get involved with a small financial investment. Horses are expensive so this is a great way to learn about a horse, their care and the equipment needed. First you need to have a goal in mind. Are you interested in riding lessons for fun and relaxation, because you plan on buying a horse or maybe you’re going to take lessons with your horse so that you can compete later on? Some instructors will offer different styles of riding such as English or Western. This will depend on what’s available in your area and which one you would like the best. The English style of riding uses a smaller saddle that has no horn and is lighter in weight. The bridles and bits are different from the Western style of riding and so is the clothing. The Western style of riding uses a saddle that is much heavier and it has a horn. Depending on what’s offered in your area you might consider an instructor that offers both styles of riding. If you know that you only want to take western riding lessons make sure your instructor is experienced in that discipline. If they’ve only ridden English all their life it will be very hard for them to teach you about the western riding discipline and vice versa. A good instructor will take you as far as they can and then recommend you onto someone else who can help you further your riding abilities. The ideal instructor will have safety as their number one priority. Some instructors will also teach you the importance of ground work which is a great benefit! Be sure to visit several facilities in your area and don’t go with the first one you find. Don’t take their word over the phone because anyone can make themselves sound good over the phone. 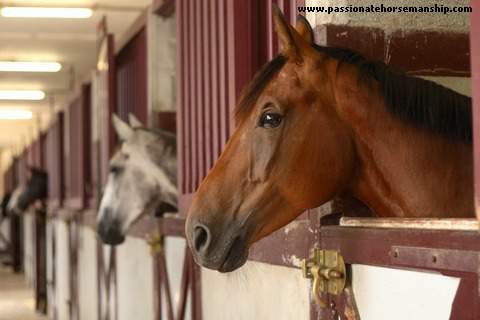 You want to visit them in person, see the facility and be introduced to the horse/s. How often can I come for lessons? Are lessons private or group? If a group lesson how many are in a group? Are children allowed in group lessons? Will I have one instructor? Can you come to watch a lesson? Ask them to describe a typical lesson. Be sure to tour the facility and take note of the students and how they act towards one another. Also notice the behavior of the horses are they pleasant and well-mannered or are they ill tempered. Is the facility clean and organized? If the barn manager gives you the tour be sure and ask to meet the instructor(s) who will be giving you the lesson. You don’t want to be surprised when you show up for your first lesson and find out that your instructor is not a good fit for you. If the instructor refuses to talk with you and answer your questions until you pay for lessons put up your red flags. This could be an indication of poor quality lessons. When watching a lesson pay close attention to the instructor do they explain things well or are they short-tempered, do they yell, are they harsh, controlling or condescending, do they finish the lesson with the student feeling successful? You also want to make sure you don’t get an instructor that is more interested in talking on their phone, texting or posting their status updates to Facebook during your lesson. Choosing the right instructor is not easy as there are those who are only in it for the money and don’t really care about your success. Take your time when choosing an instructor and don’t be afraid to visit the facility several times before making a decision.